This wallpaper is requested by trickypriest.Scan is found here at AP. At first I don't get the feeling of this scan. One thing is because I don't really like bloody or malevolent theme. I usually prefer those that are mysterious and romantic type of theme to wall. But I thought that 'why not walling something like this, just think of this as a challenge'. And so I tried walling this one. I watched Tsukihime firstto get it's feeling and kara no Kyou kai to get a BG and then there is trickypriest sending me helpful links to get to know the character. The BG is a hard one because I thought of using a stock - a bamboo forest in particular, to create a scene just like in Kara no Kyou kai 2, but sad to say it doesn't match. I also tried for a gothic castle and *gyah! * no! NO! No! no! 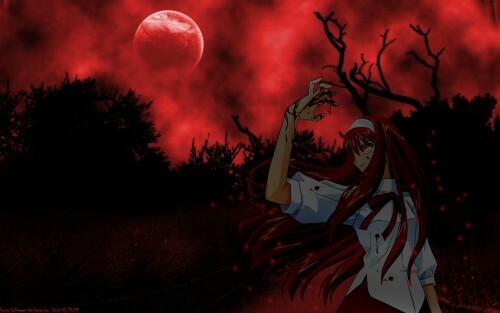 I finally ended up with this bloody moon background. Vectoring was quite normal because I find the scan big enough. I really thought that I'm gonna get a second round of my kyou wallpaper vectoring where the source is from a 704 x 396. X.X I'll really die if that's the case. I'm glad it wasn't. I also changed the eye color and the dress because I don't think the blue eyes matches the redness of the atmosphere and the violet blouse doesn't fit well. I also changed how the character stood because it seems like she was leaning onto something and the perspective isn't quite right for it. I really love the glow I placed on her eyes!Such blood lust eyes! happy Halloween guys! Hope you like this. wow! this is so cool. the color is so intense. perfect for halloween. Good job man (Y) Really Awesome.. This is wicked hot, I love it. I like it a lot! Very ceepy! You really made a great job...thanks for this wall!